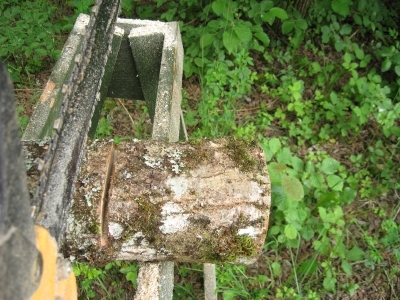 The traditional way to inoculate logs is using plug spawn, but sawdust spawn can also be used in a number of different ways. For anyone with access to a chainsaw The Saw Trench system is a quick and simple process ideally suited to narrower logs below 20 cm in diameter. 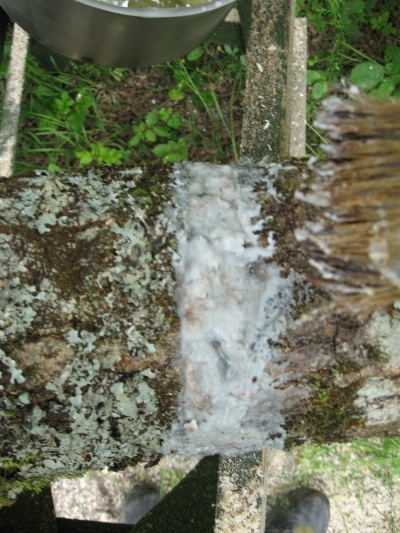 It involves cutting 4 equally spaced tenches on either side of a 1m log which are then packed with sawdust spawn and sealed over using an appropiate wax. Each log takes around 10 minutes to prepare when the task is divided into 3 parts: first all the trenches are cut; next the trenches are filled with spawn; and finally the trenches are sealed over. 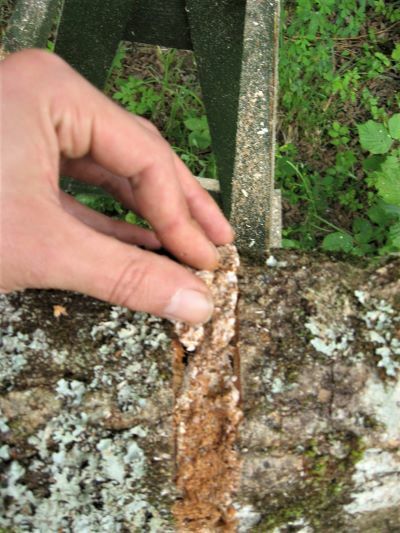 When compared to plug spawn and also sawdust spawn using an inoculation tool, the Trench System benefits from a larger mass of mycelium so therefore can achieve full colonisation in as little as 3 months. 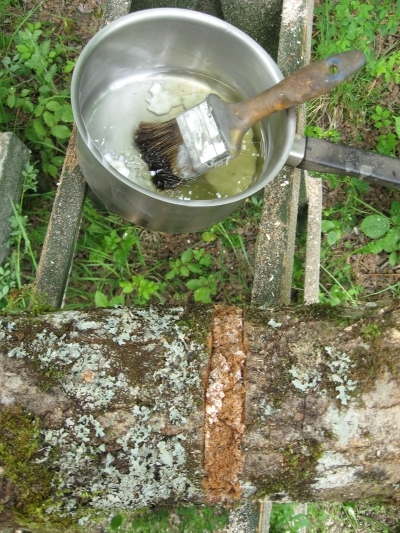 Vegetable based chainsaw oils are preferred for this method. Other than the spawn the only other requirement is for Sealing wax. The following instructions and photos outline the process and have been kindly shared by Sylvain Petit. 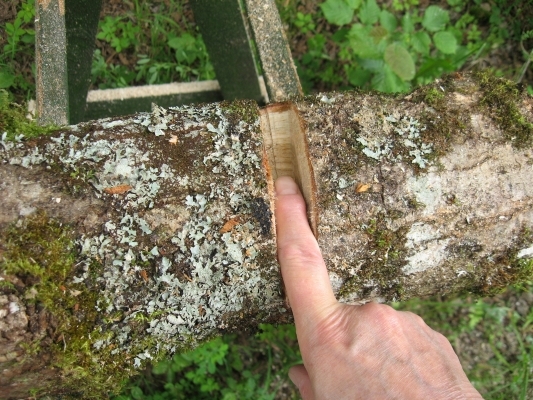 Locate the log on a sturdy stable platform to cut the trenches using a chainsaw. Using a chainsaw cut the first part of the trench to 1/3rd depth of the log taking care not to cut any deeper which will weaken the log. 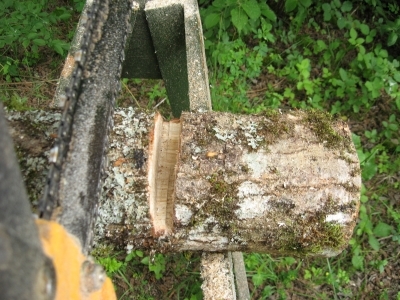 Double the width of the trench by simply repeating the last operation, or by inclining the chainsaw to open the angle. The trench will now be approximately the width of a finger which will allow for the sawdust spawn to be easily packed into. 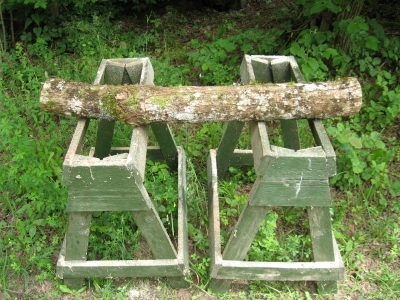 This is the template for a 1m log – 4 trenches equally spaced on opposite sides. Pack the trench tightly with chunks of sawdust spawn. Once the trench has been filled with spawn it can be sealed over using molten wax. The finished trench sealed in with wax.